Less than a year after releasing its first product, Nima opens limited pre-sale for first portable peanut sensor, a tool for consumers with food allergies. 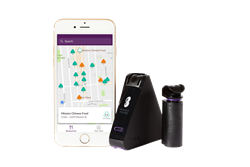 Nima improves upon award-winning gluten sensor - upgraded for optimized performance, an improved iOS app and membership program - to be ultimate companion for gluten-free living. Nima Peanut Sensor is now available for pre-order. My 7-year-old daughter, really enjoyed testing foods to make sure they were free from peanut. This little sensor will now be a big part of our tool box in addition to all the precautions we currently take to keep my daughters and me safe. At CES® 2018, Nima® today announced its highly anticipated peanut sensor is now available for pre-order, adding a new product to its portable food sensor platform. Nima has also launched a second generation gluten sensor, which enhances the award-winning device with optimized performance, an improved iOS app experience and premium membership program. Nima is the first and only pocket-sized device that allows consumers with special diets to quickly test their food for different proteins for added peace of mind at meal time. For the 15 million Americans with food allergies, eating foods they haven’t prepared themselves can be rife with risk. Reactions to peanut vary widely from stomach aches, skin reactions, and in some extreme cases, anaphylaxis. When eating is a gamble, having an extra tool to take the first bite can help remove anxiety from the plate. The Nima Peanut Sensor is a quick and portable device that will test a sample of liquid or solid foods for the presence of peanut proteins that can cause allergic reactions. The peanut sensor is being developed to detect 20 parts per million (ppm) of peanut protein or more at 99 percent accuracy. If the Nima Peanut Sensor detects peanut proteins, the sensor will display a peanut icon. If no peanut proteins are detected in the sample, the sensor will display a smile icon. Nima developed the peanut sensor to be sleek and discreet, while being easy to use so families and people of all ages can benefit from Nima. The device will connect to the Nima mobile app to share test results and allow discoverability of peanut-free friendly restaurants and packaged foods. “These updates to our gluten sensor will make it even easier for the gluten-free community to harness the information of the tens of thousands of Nima tests happening all over the world,” said Yates. The first and only product of its kind on the market today, Nima’s sensors test a sample of liquid or solid food on-the-go, using a patent-pending blend of chemistry, electrical and mechanical design, simplified into three easy steps. Place a pea-sized sample of food into a one-time-use capsule and screw on the cap. Insert capsule into the device. Press the power button and begin testing. In about three minutes, the sensor will display the test result - a wheat or peanut icon if the protein is detected or a smile icon if the sample has less than 20 ppm of gluten or peanut. Nima owners can then sync to the community via the Nima App and add results and reviews to its database of food options. Community members can rate restaurants and packaged foods based on their results and accommodation of dietary needs. The Nima App is available to download for free in the Apple App Store. An Android version is available for sensor firmware updates in the Google Play Store. The Nima Peanut Sensor is available for pre-order now in the U.S. and Canada through March 8, 2018 on the Nima website. A Nima Starter Kit - Peanut is discounted at $229 ($60 off) during the 60-day pre-sale. A starter kit includes the sensor, a 12-pack of peanut test capsules, a charging cable and a carrying pouch. The Nima Starter Kit - Peanut will retail for $289 and ship later in 2018. Additional 12-packs of test capsules will be $72 each, or discounted to $59 per pack by selecting auto-delivery or the premium membership program. A Nima Starter Kit - Gluten is available now in the U.S. and Canada on the Nima website or Amazon for $289. A starter kit includes the sensor, a 12-pack of test capsules, a charging cable and a carrying pouch. Additional 12-packs of test capsules will be $72 each, or discounted to $59 per pack by selecting auto-delivery or the premium membership program. The Nima Premium Membership is $9.99 per month with a six-month commitment. At CES 2018, Nima will be showcasing at Digital Health Summit at Sands Expo booth #43434 from Tuesday, Jan. 9 through Friday, Jan. 12, 2018. Join the waitlist for milk, tree nuts and other allergen sensors here. Founded in 2013, Nima is a science-driven technology company making the world safer for people who want and need to know what’s in their food. Through people-friendly products that identify individual ingredients in food, and a growing community of users and data, every day Nima enables people to enjoy what’s on their plates. Co-founders Shireen Yates and Scott Sundvor created Nima out of personal experience with food intolerances. To date, Nima has raised more than $15 million, including financing from Foundry Group, Upfront Ventures, SoftTech VC, SK Ventures and Lemnos Labs, with additional federal grants from the National Institutes of Health. For more Nima news, visit our blog.